Bucharest, Capital of Romania. On the evening of September 19, 2015 (Monday), the façade of the House of Parliament, also known as the Palace of Parliament, was transformed into a gigantic outdoor screen with a total area exceeding 23,000 square meters (290 meters wide, 80 meters high). 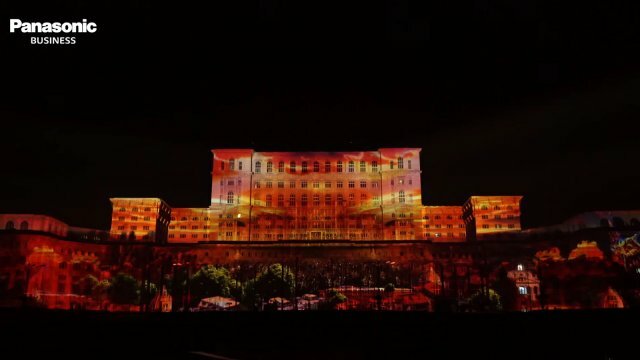 The world's largest projection mapping event, called iMapp Bucharest 2015, was held with images of an overwhelming scale produced by more than 100 Panasonic professional projectors for the enjoyment of thousands of spectators. Panasonic's newest projector, the PT-DZ21K2, was used to project massive images that literally covered the walls of the Palace of Parliament, the world's second largest civilian building. A total of 104 projectors were used to render breathtakingly bright and vivid images. Architectural lighting was also synchronized with the video mapping, and the number of projected films was increased from the four films of iMapp Bucharest 555, which was held in 2014, to six. A pixel from the huge images projected onto the façade was just 2.3 cm in size. This produced enormous resolution when you consider the scale of the projected image and the distance to the audience. It resulted in highly realistic, advanced, high-quality projection mapping. Adrian Pochiscan, Technical Director of 360 Revolution, the company that produced this magnificent show, described it as follows, "We decided to make the show even greater than the one in 2014, so we took advantage of the new PT-DZ21K2 projector, integrated seamlessly with the previous model. We started the preparation on site a week before, with a team of 6 video projection engineers, and 2 more engineers specialized in media servers. These detailed preparations led directly to the show's success." Eduard Tronaru of Panasonic Romania added that the PT-DZ21K2 featured 10% less energy consumption. This is an important energy-saving effect when dealing with an event like this where more than 100 projectors are used. The image control was also improved, and the frame rate got a substantial upgrade: from 60 fps up to 120 fps. According to Mr. Tronaru, "In terms of size, efficiency and reliability, the new product is sharing the DNA of the previous generation. With its many new improvements, the PT-DZ21K2 was able to greatly raise the quality of the 3D projection mapping for this event." There is a substantial demand in the market for a professional projector having a small size, high energy efficiency, and big brightness. On top of all these, the PT-DZ21K2's maintenance is easy and it has a very competitive price. The success of iMapp Bucharest 2015 clearly shows that Panasonic's PT-DZ21K2 is more than up to fulfilling these market needs.